Venturing into the pages of Monkey Fist was like catching up with old friends, with one exception. The Samurai Kids have grown since we last met. Although there is no hint of added height, each has matured. Niya, the narrator has a classic stubborn streak that seems more entrenched. Yoshi, Niya’s blood brother has a secret and Niya can’t stand it. Kyoko disappears and the Samurai Kids aim to rescue her, but everything moves too slowly for the impatient Niya. Much is the same in this fourth book, yet nothing is repeated. We are called to look beyond what the eyes can see, but the dimension we enter is more abstract. Can you trust a friend when all the evidence suggests he is betraying you? Is there ever a time when it is better not to know everything? Friendships are stretched thin. Themes of trust, appearance and disguises develop further in Monkey Fist. Can you recognise evil when it is wrapped in wealth and authority? Is it ever wise to obey without questioning? How can people with bad intentions be given great power and influence? It is all about façade. 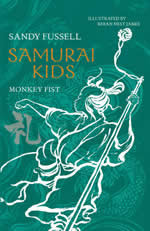 Although Monkey Fist is an easy read, the layers of hidden meaning shimmer with invitation. Looking beyond what is seen is a risky business, especially if the imagination distracts and confuses. While the storyline is as action-packed as ever, the dangers are greater. Lives are at stake. Hearts may be irreversibly broken. 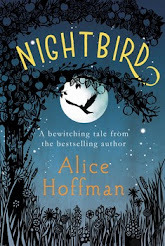 Humour continues to thread through the pages, but the laughter elicited is more subdued. Double truths hover like a shadow. With the turning of each page, little flames of enlightenment flicker. As always, nothing is lost if the reader doesn’t fully understand the lessons within. However, insight into the complexities of relationships will grow if the sharp-witted messages are heard.